This whole adventure came to be because I realized that I have enough tea stashed away in my kitchen to run a tea house…but I could not honestly say that I had all of the tea I own recently, or even at all. That’s when I decided that I needed to change this. I also decided that I would make it into an ongoing journal project, to get me writing again and to motivate me to actually do a tea every day. It is far too easy for me to just skip the things that take a little extra time in favor of something quick and technically easier; keeping a tea journal would force me to make space in my busy day to slow down. And then it occurred to me that I may not be the only one who feels this way, feels that life is just moving on way too fast. So I will endeavor to post my Tea Of The Day, plus whatever thoughts I may have about life and such as well. Welcome to Cat’s Tea House. May your perfect cup find you when you least expect it. Hello my lovely fellow tea enthusiasts! The descriptions I write generally come directly from the company that made the tea, usually word for word, although I do paraphrase if I find the wording to be awkward. Liquor: the technical name for the liquid that is the result of steeping tea leaves. As I find more interesting resources I’ll add it to this list! Liquor is a dark amber in the cup. Steeped tea also smells sweet and strongly of vanilla. The tea is pretty simple, just slightly rich and lightly flavored but pleasant to drink. Adding a little sugar really makes it taste like a cookie. I realize this song is a few years old, but whenever it pops up on the radio I find myself turning it up and singing it out loud as I can. I’ve survived and prospered over things that I thought would crush me, grown and changed—mostly in ways I’m actually proud of. But this song is not just for me. This song is for anyone who is struggling, who thinks that they can’t go on. You can, I promise. The “you” in the song isn’t anyone but your future self. You’re making your way there and you can make. You will. Description: Enjoy this popular combination of sweet and salty, now in a teacup. Our all natural blend of hand-picked black tea and succulent caramel with just a hint of salt flavor is the perfect treat. Add a splash of milk and a little sweetener for a sublime guilt-free indulgence. Dry tea smells quite strongly of caramel, with a robust undertone–a very promising start. Liquor is a light chestnut brown in the cup. Steeped tea smells pretty much the same way, maybe a little sweeter. The flavor is very mild but sweet. Doesn’t really taste like salted caramel until I lick my lips, so it’s definitely more in the aftertaste than I expected. Adding a little sugar actually brings out the caramel flavor quite a bit. One of my favorite things about tea is how much a tea leaf changes from the dry to the steeped version. For this reason, some of my favorite teas are the tightly rolled kind that expand to three or four times their original size. I even love blooming tea, even though usually I can’t get the tea bulb to actually sit on the bottom of the pot like you see in pictures. This unfurling and changing of the tea leaf makes me think of the changes in life. Hot water (hardship) can make us bitter or it can make us beautiful. Sometimes both. And, unlike the tea leaves in my tea pot, we have a choice in what hardship does to us. Of course, like most things worth doing in life, it’s not easy to choose the more beautiful path every single time something bad happens. Sometimes we have to be bitter or angry before we can see that it’s not serving us. Sometimes, when we’ve been hurt enough, that bitterness or caution is a reasonable reaction. Life isn’t always simple. But I think it’s worth remembering that hardship (or at least the result of it) can be beautiful and transformative as well as painful. Dry tea smells sweet and spicy with a full-bodied richness in the undertone. Steeped tea smells similar although a little more mild. 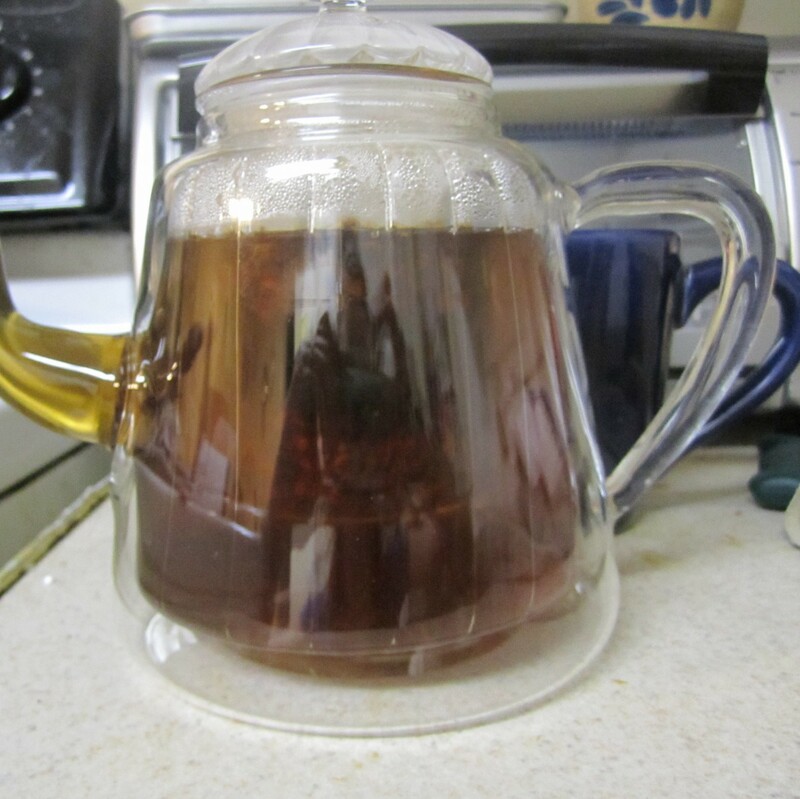 This tea takes well to a long steep time, and if you’re using a bigger cup or a small pot, be sure to use plenty of tea leaves (tea baskets are great for that! ) The tea itself is lightly sweet with a cinnamon-ginger aftertaste. The tea is also astringent, but not overwhelmingly so. Adding sugar cuts that astringency. It’s been about a week since my last post and things have been….interesting. The next day was easier. I still had the feelings but it took a lot less to come back to a middle ground. Not exactly neutral, but calm. And then the day after that was a storm of emotions, with shame being absurdly high on the list. But, by the end of the day, I was able to sort through them all and identify what all was happening. And, even more importantly, talk about what was bothering me. In the end, the most important thing I’ve learned so far is something I pretty much already knew. It’s a choice. Every day it’s a choice to be a calmer, kinder, better person. Description: We age organic Assam black tea with real Italian Bergamot so the tea absorbs the orange scent. Enjoy a robust (flavorings-free) Earl Grey with subtle citrus notes. Steeped tea smells lightly sweet and earthy, a little like toasted brown sugar. It doesn’t taste that way, at least not up front, but it does have a pleasantly sweet aftertaste to it. Adding sugar brings it up to tasting like a citrusy, earthy earl grey that lingers pleasantly after the cup is finished. The year is drawing to a close, as I’m sure you all know. I’m probably not alone in looking back, being introspective, and re-evaluating some things. After all, it would be hard to make new year’s resolutions if no one ever reflected on their lives. This year for me there have been some hard conversations. The kind of hard that leave me feeling wiped out and honestly a little scared. But if I didn’t have them where would I be? It’s a rhetorical question. I already know the answer: spinning my wheels but fooling myself that I’m moving forward. The main thing that has come out of this is that I cover up most of what I feel with anger and hostility and trying to control everything around me but myself. For whatever reason I’d rather be angry than deal with whatever is causing the strife and/or my own thoughts. I want to have good friends, but more so I want to be a good friend….which is not something I can do while I’m being spiky in every direction. So I need to spend time with myself…yoga, journal, walk, maybe eventually mediate and just be still. Basically just be more mindful. To that end, I intend to pay attention to when I’m getting irritated and instead of letting it happen, asking myself “why”… and then letting it go. I don’t expect it to be easy, but it’s needed. And there’s no better time than now. Description: “Living in an increasingly toxic world can take a toll on your body, even your skin. Responding to such concerns, our herbalists created this tea to help beautify skin by gently stimulating the body’s natural detoxification process. * By helping the liver break down fats during digestion and by promoting flushing of the kidneys, the herbs in this tea gently support the body’s ability to carry away wastes. * Pleasantly mild, bittersweet, and earthy, this tea is a classic European herbal combination of burdock root, stinging nettle and cleavers blended with lemon myrtle for a lemony-citrus taste. Dry tea smells sharp and somewhat like fresh cut grass with a back note of lemon. Steeped tea smells similar, but milder. Liquor is a clear yellow-amber in the cup. The tea itself is…interesting. Not unpleasant by any means, but the flavor is hard to pin down. It’s a little lemony, a little sharp, not particularly sweet but not terribly bitter either. The only really negative thing about it is that it leaves my mouth feeling somewhat dry. It’s finally getting cold outside! Don’t worry, I accept the side-eye that I’m getting from a lot of people right now. I’m just more a cold weather person. Autumn and winter are my jam. Which is not to say I don’t enjoy summer, because I do…up to a certain point. Everyone needs a little sunshine in their lives. But really, this why fall is perfect. It’s still sunny in many areas, but cooler. You can just go out your door and walk without needing to carry a water bottle or anything similar. Just you and your dog (if you have one) and maybe a camera ( or a sketchbook) if you’re in the mood. And then we have winter. For me, the colder it is the more energized I feel, pretty much. I like to get out and walk then come in and warm myself with a hot beverage and snuggle up under a blanket. I also nest more; there is quite often more cooking and baking that happens when it’s cold outside just because doing these things doesn’t make the house unbearable. I also clean a lot more, with more enthusiasm and genuine enjoyment. Particularly as we get towards the end of the year, as kind of a way to get rid of unwanted energy as well as dirt and start the new year fresh. Case in point, I spent an hour or so cleaning up and re-organizing what I consider to be my creative/witchy space and it feels so much better. And last night while I was making dinner I washed the dishes and the counters and swept the floor in a flurry of activity. My next little project is going to be the area where we keep most of our books, as it has also gotten cluttered. Description: Herb Tea for Detoxing – Had too much of a good thing? Feeling out of balance, a bit heavy or puffy? Then it’s time to get clean. Dry tea smells light and sweet, very similar to a vanilla rooibos tea I already have at home. Steeped tea smells pretty much like the dry, with a hint of something a little spicier. The tea itself is a little bland. It does have a sweet vanilla flavor that lingers a bit, but it otherwise pretty unremarkable. Last night another vivid dream occurred. This one was little more action-oriented; like scenes from a movie rather than just one very strong image. In this dream, me, my husband, and our roommate were traveling. Actually more like a trek, or a pilgrimage. Some kind of long journey with no set end that I was aware of in the dream. Everywhere we went was frozen and/or snowy, even though the days were long like spring or fall. Sometimes we slept in tents, or in whatever vehicle we were traveling in (this changed from scene to scene), but also at times we stayed with hospitable strangers. These strangers would give us food and shelter, and news. Also sometimes food to take with us. Wherever we went, though, we were always careful to not reveal our pets to anyone unless they first showed us theirs—I got the sense that whatever had happened to the world had somehow been connected to household pets. A lot of places we went had underground places that were kept warm and had grow lights in them–the only real way to grow food in a world gone cold. Oddly enough, though, the wildlife didn’t seem to be suffering at all from it, like they knew something we didn’t. Eventually we started following the animal trails, and when I woke up we had just reached a cozy little cabin-style house at the edge of what seemed to be a truly vast forest. This is actually the first time in a while that I’ve had a dream like that where I wasn’t going solo, like my brain realizes I won’t be in scary situations if I’m with my husband or my best friend (or both of them as in this dream)…and as I think of it, this dream wasn’t all that scary, just active and interesting. And that’s my trip into dream musings for today. Hope everyone reading this has good dreams and restful sleep tonight! Dry tea smells sweet and herbal with a hint of something sharper, like lemon or maybe lemongrass. Steeped tea doesn’t have much of scent. It is lightly sweet, slightly lemony in flavor. It has a smooth mouthfeel and is pleasant to drink. Today just a musing on my dreams. I’ve been sleeping really heavily the last few days because I’ve been sick, and having trouble waking up in the morning. As a result, I’ve been trying to give myself more time to wake up in the morning. This morning, I felt like I was still in my dream even after I woke up, and one image was very vivid, lasting even until I got to work. In my vision, I looked over my shoulder down the upper part of my right arm and saw a Japanese style dragon there, it’s intensely staring face looking out to my right, as if watching my back. He was very colorful, red and gold and shimmery black, and even some green but also just an outline in some places so you could really see the mountain waterfall that was behind him. To my dreaming mind this was because he was meant to represent being made powerful by being in harmony with the world that surrounds rather than trying to be overbearing and dominating over it. As I looked at the tattoos there were some (I assume Japanese) character at the bottom near my elbow that disappeared as I looked at them because I didn’t know what they meant and I don’t want to have ink I don’t understand. I’m not sure what it means, if it means anything at all, but I like the picture it paints anyway. It was beautiful, and powerful and comforting all at once. I don’t know that I’ll ever get that tattoo in reality but it was still an interesting image to wake up to. Maybe I’ll look into the lore behind the Japanese dragon some more, see if anything there tickles my mind.